Upon installation of the ETS Intercooler Kit, the car shows a 21.05hp increase and makes 361 peak hp. Outlet temps are only 59deg at mid pull and the temps only rise to 66deg at the end of the run. 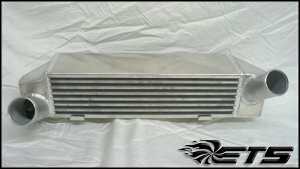 These temps are signifigantly lower than stock, and it is no surprise that there is a substancial power increase with the intercooler kit installed. Aside from the midrange, we also noticed a slight Increase in top end power as well.